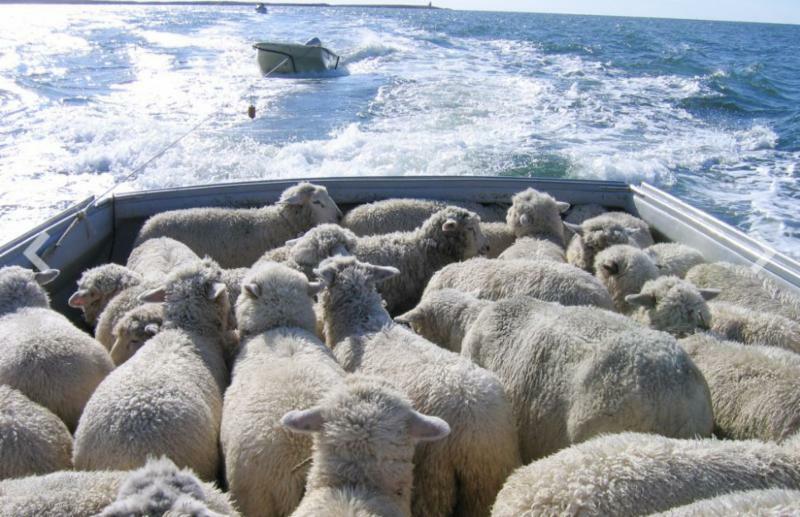 Off the coast of Downeast Maine lies Little Nash Island, home to a very special flock of sheep. “The story of Nash Island Wool began in 1916, when young Jenny Cirone’s father became lighthouse keeper of Little Nash Island, off the coast of Downeast Maine. Jenny started her flock of sheep, joining Maine’s centuries-old tradition of raising sheep on its uninhabited coastal islands. She lived on Little Nash Island with her family and flock for 19 years, purchasing most of it, as well as neighboring Big Nash Island, after the lighthouse was decommissioned. Moving to the mainland, in sight of her beloved islands, Jenny tended her island flock until she passed away at the age of 92. She entrusted her flock and the islands to her next-door neighbors and close friends, the Wakemans, who continue to tend Jenny’s flock and take care of the islands just the way Jenny always did. Jenny’s flock of 150 or so sheep are an Island Descendent/ Coopworth/ Romney mix, a hardy breed well adapted to island life. They graze out in the open, thriving on green island grasses and mineral-rich seaweeds. This island life style produces beautiful soft, clean, ‘fog-washed’ fleeces. 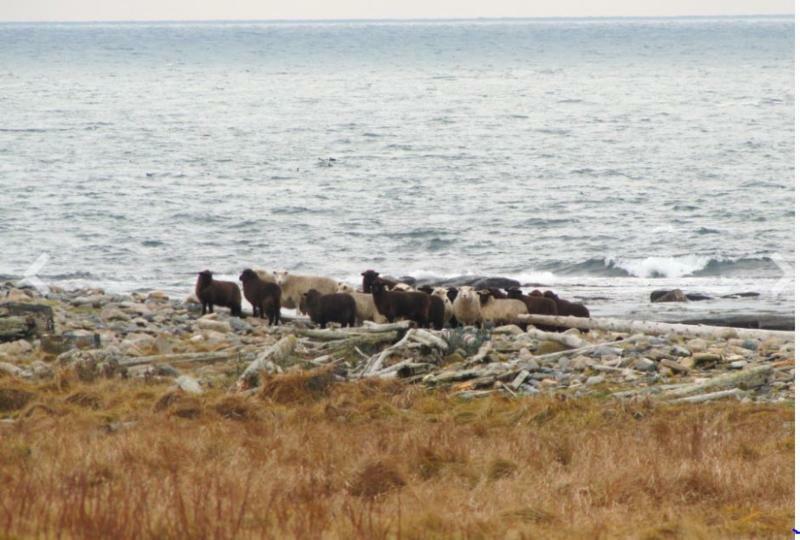 Wild as they are, the sheep prefer the island to themselves, barely tolerating seasonal visits from their shepherds. In May the Wakeman family daily check on the ewes as they lamb. In June with the help of family and friends, the sheep are rounded up, the new lambs are checked, the ewes are sheared, and the rams removed to their own island for the summer. In November the sheep are rounded up once again, and the ram lambs come off the island, bound for market. In early December the rams go back with the ewes for breeding, starting the cycle anew. We thought that the best way to celebrate this special fiber that we have the honor of spinning here at the Mill for Jani Estell, was with a design that features botanical details reminiscent of the wild grasses and seaweed that feeds the flock this yarn is from. The Cirone shawl, designed by Larisa Demos for our 2018 Mystery Project Club, is a luscious garter stitch crescent shawl of Alpaca Elegance with a delicate lace border created with undyed Nash Island Tide yarn. The shawl is finished with a botanical button designed by our friend Katy of Katrinkles. 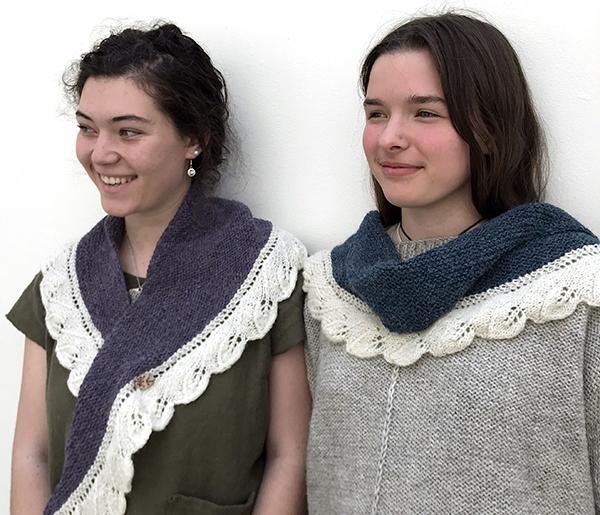 You can find all of these beautiful materials with the links provided here, or you may opt to knit up the shawl with two contrasting skeins of Alpaca Elegance and a button or shawl pin of your own! Next Next post: Breaking news: a new yarn!